Last September 2012 Chulilla was affected by a huge fire that started in one of the electrical buildings near the Loriguilla Dam. It also affected other villages like Gestalgar, Sot de Chera, Pedralba and Bugarra. 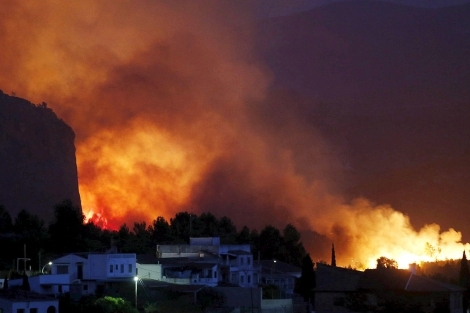 The fire burned more than 5,000 hectares of forest. Sector Fantasía: Routes affected: El colmillo y Reto pa rato. Sector Fantasía II: All routes to the right of Edén. Sector Pesadilla I: Routes affected: Braves patates, Calor de invierno y Adelscoh. Sector Pesadilla III: Route affected: Yo te love que pa qué. Sector Tragapo: All routes to the right of Tragapolla. Sector La Sima: Affected, pending review. Sector Penya Roja: Affected, pending review. Peña María (Gestalgar): Affected, pending review. This crags are not very popular nowadays and practically all the “good stuff” that is located in the canyon that was not affected by the fire.